4. God honors faithful obedience (Moses). Elijah: A Man of Heroism and Humility is one of the shorter books in this series, weighing in at only 175 pages. However, it packs a punch in a rather surprising manner. Whenever I think of Elijah, I think of him standing on a mountaintop, taunting the priests of Baal into ridiculousness. Elijah is victorious and triumphant in my mind; he is a leader of the pack! I typically do not think of Elijah as one who was removed by God from society for a period of years in order to be alone. 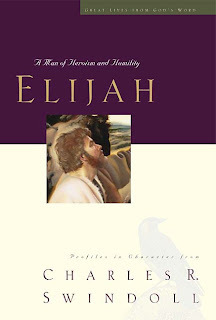 I think of Elijah as a powerful and amazing man....not as one who sat by a brook being fed by ravens in quiet solitude. I have to say that it's becoming more difficult for me to want to pick up the next book in this series and parts of me want to stop and not continue. However, I said I was going to read this series this year because I knew it would be beneficial. Beneficial, as you know, is not always fun and exciting. It was with some trepidation and feet dragging that I picked up Elijah this month. And it's with even more foot dragging and trepidation that I'm sitting down to write up my thoughts on it! But that's part of the exercise and I can't squeak by and pretend I forgot. Now imagine you are Elijah. You've just done what the Lord has called you to do - and that's probably a hard thing. Now what? Are you looking for the pat on the back? The words of affirmation? Those warm fuzzies we all love to receive at the end of a job well done? Instead of God exalting Elijah for his obedience in delivering a hard message, God removes him from society and sends him out for some time of solitude and soul searching. It's not expected. In fact it is unexpected! But that's the way God is. You're walking along, being as obedient as you can, and suddenly you find yourself in a position you never imagined yourself to be in. In a lot of ways - you are alone. Alone with God. And since you can't see Him with your physical eyes and you can't hear Him with your ears you've gotta be wondering what's going on. As a first born, let me tell you that this is NOT the message I wanted to be hearing. I don't like to be told, for lack of a better phrase, to "sit down and shut up." That's a really unpleasant message in and of itself. To be alone? To be quiet? To just listen and learn what God would have for me in the stillness? That's a really hard place for me to be. Surely I will uphold you with My righteous right hand." Anyone ever afraid of opening up scripture because you fear you'll be convicted to change? Then you discover the blessing that comes from the word, sustaining you with life giving words and examples of men and women of the faith? That's me this month - expecting the discipline, and finding the love. I've felt a pressure to "hurry up!" in a few areas and reading about Elijah was a comfort in feeling God's hand on my family saying, "No rush. We're here now. Take it slow." Number one: God's leading is often surprising; don't analyze it. Number two: The beginning days are often the hardest days; don't quit. Number three: God's promises often hinge on obedience; don't ignore your part. Number four: God's provisions are often just enough; don't fail to thank Him. Swindoll goes on to remind the Christian that trials are "temporary" but God has us go through them periodically all throughout life in order to draw us closer to Himself. The trial may be downright painful to just uncomfortable in spots. But God's goal in it is to make us to know Him more fully. We want pain to END and be OVER with and done with so we can move on in a happy life. But God can't use us unless He wounds us. If we aren't wounded, then we don't understand why we need a Savior. Thy dross to consume and thy gold to refine." Oh but it isn't fun. And it's quiet. And it's scary. Finding myself in another "unknown" moment in time, I think it suits again and I offer it here for you in case you are need of some encouragement in your period of waiting, and in your 'alone time' with God. Solitude is good. Times of quiet reflection and communion with God are healthy and healing. Without them, it's impossible to move forward in a mature walk with God. I'll take the mature walk, thanks! Even if it means sitting down and shutting up for awhile. If God wants to do a work in me through a time of silence, I'll go there with Him. It is the very least I could possibly do. Furthermore, I'll take my time and try to make it His. Step-by-step, day-by-day -- wherever He leads, I will follow. You're right, when we think of Elijah, it is usually the "big moments," like facing down the prophets of Baal that come to mind rather than those quiet years at the brook. I'm the personality that would much prefer the quiet solitude, thinking, praying, reading, communing, and whatever else he was doing. :-) So for me the harder lesson would be being willing to step out and let God use you in ways you would not have sought out and wouldn't naturally gravitate to. I guess the bottom line is being willing for that either way, either direction. It's interesting that I think just the opposite about Elijah. As someone who has struggled mightily with depression in the past, I can so relate to Elijah when he lay down under that tree and didn't want to get up. And he was ministered to with plenty of rest and food and was restored. It's a good reminder for when life gets overwhelming. How many books are in the series? Did you get them all in a pack or one by one? I am really enjoying your take on the series and I am getting ready to start Joseph. Enjoying your book reviews...reminding me of books from the past that I enjoyed or intended to read...these are among them. I remember hearing Swindoll on the radio when he was writing these. He is now in my city and I have never gone to hear him in person...I need to do that. I thought of my brother a lot while reading your post, Isaiah 41:10 is going to be his Bible verse today.